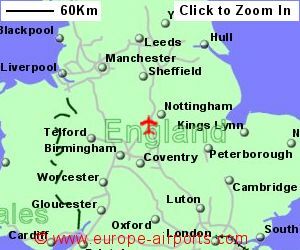 East Midlands airport lies in the centre of a triangle with Nottingham, Derby and Loughborough at it's points, being approximately 12Km from either. Short term and some long term car parks are within walking distance of the Terminal building, while car park 7 is approximately 1Km distant with a shuttle bus service for the 8 minute journey. The railway stations of Loughborough, Long Eaton, Nottingham and Derby can be accessed via a buslink from the airport, running every 30 minutes for the 35 minute journey. A taxi from the airport to Nottingham is likely to cost 30 - 35 pounds. East Midlands airport has 7 bars/cafes/restaurants, 10 shops, 2 banking/currency exchange facilities, an executive lounge, an Internet access point, and FREE WiFi Internet access (payment required after 60 minutes). East Midlands airport has Airport Carbon Accreditation, at the Neutrality level. 4.8 million passengers passed through Nottingham East Midlands airport in 2017, a 5% increase from the previous year.